The Minnesota Twins are not letting a slow offseason stop them from rebuilding their bullpen. 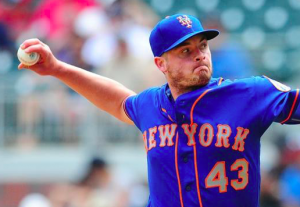 They added another piece to that bullpen Saturday, agreeing to terms with Addison Reed. The deal is reportedly worth just under $17 million over two years. Previously this offseason, the Twins also signed relievers Fernando Rodney and Zack Duke. Reed was not considered one of the top elite relief pitchers on the market this winter this winter. However, he was one of the best among the second-tier relievers available. He’s not an overpowering pitcher like traditional closers. But he fills the strike zone and gets good movement on his slider, allowing him to maintain a high strikeout rate. The Twins will become Reed’s fifth team since making his big league debut in 2011. He was traded to the Mets in 2015 and became a key part of their run to the World Series. Reed was then an invaluable part of New York’s bullpen in 2016, posting a 1.97 ERA in 80 appearances. With the Mets out of contention last summer, they traded Reed to the Boston Red Sox for the stretch run, allowing Reed to pitch for a playoff team for the third straight season. Between the Mets and Red Sox, Reed posted a 2.84 ERA in 2017. Reed is also one of the most durable relievers in baseball. He ranks fifth in total appearances over the last five seasons. Since he doesn’t rely on overpowering hitters, he’s rarely bothered by arm issues and has never been on the DL during his big league career. Reed is also able to pitch on back-to-back days without any drop off in his performance, a trait that should be useful to the Twins. According to reports, Rodney is still in line to be the team’s closer. However, Reed also has experience in that role. Reed was New York’s closer for much of last season, saving 19 games in 21 opportunities. He also served as a closer from 2012 to 2014 with both the White Sox and Diamondbacks. Rodney, meanwhile, has 300 career saves. He was Arizona’s closer last season, collecting 39 saves in 45 opportunities. Of course, the 40-year old also posted a 4.23 ERA, as his stuff starts to diminish despite the experience he brings to the table. In any event, the Twins have improved their bullpen substantially with the signings of Reed, Rodney, and Duke. Despite making the playoffs as a wild-card team, Minnesota’s had one of the worst bullpens in the American League last year. It was definitely an area where the Twins needed to improve this winter. On top of the trio of newly-signed players, Trevor Hildenberger and Taylor Rogers should be ready for prominent bullpen roles. Both had ERAs in the low 3’s last season and should be good fits in a complementary role in support of veterans like Reed and Rodney. That should give the Twins a considerable amount of depth in their bullpen. Even if they lack high-end talent at the back end, Minnesota’s bullpen should be much-improved from last season. Reed was quietly one of the better relievers on the market, and the Twins were able to sign him for a reasonable price. He should solidify Minnesota’s bullpen, preventing it from being a weakness for the Twins in 2018.